The Bicolor Chromis Damselfish are plankton-feeding members of the saltwater damselfish family from the Indo-Pacific region. Several very similar species also occur on coral reefs in the Caribbean and Florida Keys. Except for breeding individuals guarding clutches of eggs, Bicolor Chromis Damsels typically live in schools in the vicinity of branching stony corals. They hover over the corals and feed on small planktonic creatures that drift past, quickly retreating into the protection of the coral branches at the first sign of danger. 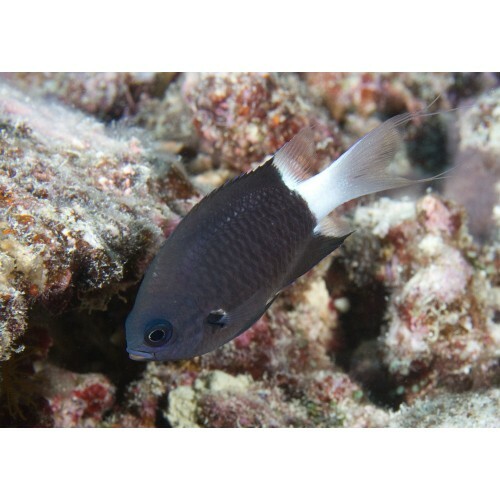 The Bicolor Chromis Damselfish maintain algae farms on a patch of reef by clearing the patch of any live corals, by selectively removing inappropriate algae species, and by driving off herbivorous fish such as tangs and other surgeonfish. These damsels feed on the algae or the small invertebrates that live among the algae. The Bicolor Chromis Damselfish is rather hardy and easy to care for compared to many saltwater fish. These lovely fish can make beautiful additions to many tanks or reefs.